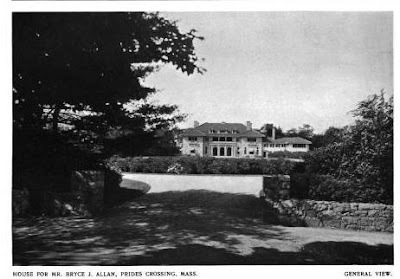 'Allanbank', the Bryce J. Allan estate designed by Guy Lowell c. 1905 in Prides Crossing, Massachusetts. Allan was the son of Sir Hugh Allan, founder of Allan Shipping Lines' Montreal Ocean Steamship Company and one time richest man in Canada. 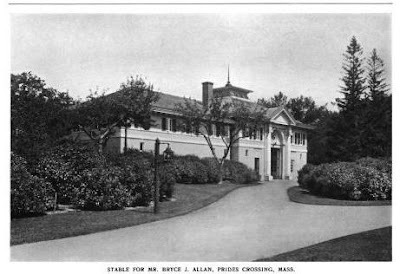 Today the estate functions as 'Tupper Manor', part of the Wylie Inn and Conference Center at Endicott College. Click HERE to see 'Allanbank' on bing. Photos from Architectural Review, 1906. 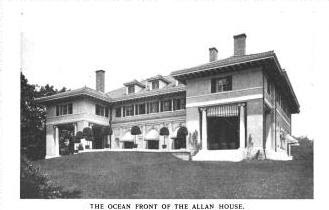 I've always liked this house---Endicott College, like Salve Regina in Newport is both savior and destroyer of old estates in its neighborhood---i.e. the houses mostly survive, but the landscapes, and the infill buildings, and paths, parking lots and industrial lighting nevertheless have pretty much destroyed the ambiance. Ponder the far portion of the service wing. 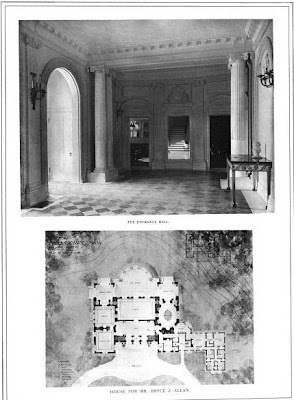 Contained in it are the Servant's dining room, back stair, two corridors, and four servant's bedrooms, in approximately the same amount of space occupied by the entrance hall of the main house. Life has never been fair. The entire first floor of the service wing fits in less that the space of entrance hall and library. I particularly like the way the oval dining room is placed, for axes and vistas, and the way it works with the porch beyond. Nice bit of spatial effect. Thank you for the pictures. 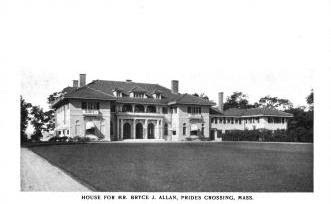 My grandfather was a footman/butler for Bryce and Anna Allan in Beverly the 1920's. He must have worked here.